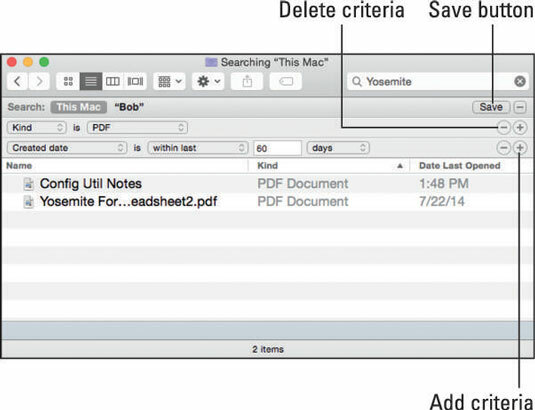 Choose File→Find or press Command+F to move the pointer to the search box of the active window. If there’s a specific folder you want to search, open that folder before pressing Command+F. If no windows are open, the Desktop window will open with the pointer in its search box. Type the letter a, and the window starts displaying the results. At the same time, a menu drops down below your pointer to offer search suggestions, such as Filenames and Kinds as shown, as well as others such as Dates, Sent By, or Downloaded From (not shown). Select an item from the menu to narrow the scope of your search. Or, type additional characters: The more you type, the fewer matches and suggestions you’ll see. Spotlight’s default behavior is to search files’ contents if it can (and it can search the text inside files created by many popular applications). Third-party Spotlight plug-ins are available that let you search the contents of file types not supported by Yosemite, including old WordPerfect and QuarkXPress files and many others. Search the Internet for Spotlight plug-ins, and you’ll find them for dozens of popular apps. If you know all or part of the file’s name, you can limit your search to file names (that is, exclude text in files and search only for files by name). Just choose Name Matches: (it’s a in the figure) from the drop-down menu. You have a choice of where to search. “This Mac” is selected in the following figure. You can choose additional search criteria — such as the kind of file (PDF here) and the date the file was created (Within Last 60 Days) — as well as other attributes, including Modification Date, Creation Date, Keywords, Label, File Contents, and File Size.